The point where home garden decoration and talent intersect, comes in the design stage of your miniature glass garden. Most anyone can lay out a miniature landscape in a terrarium, as you don’t need design credentials or experience — no one can really tell you exactly how to accomplish the feat — and it has to come from your heart. But that said, I’ll try to offer some design ideas that might make the process roll easier off your fingertips. Like any canvas, plan to fill the entire space of your terrarium. Begin by laying out your scene before starting, to get a sense of efficient usage of space and also to balance colors, textures, and layer heights. Keep in mind that the little plants will increase in size, so factor in slight expansion. Remember that most terrariums offer vertical as well as horizontal space. Think about taller plants (ferns, aralias, ivies, etc) that might grow upward. And, don’t forget that it’s usually possible to prune plants to prevent them from pressing against the lid of a jar or the roof of a Wardian case. A good rule of thumb is to think in terms of threes and triangulate your plantings. Choose plants with the three-theory in mind. Correlating colors can be very effective, especially when you look for subtle nuances in leaf hues. Because terrariums are displayed in shady locations, consider using plants with golden foliage to make the scene “pop” rather than dark-leaved plants. A shiny object, a ceramic piece, or a small orb can give an important contrast. While working, make sure your terrarium looks good from all angles. After all, you might need to rotate the container to expose all sides to balanced light. 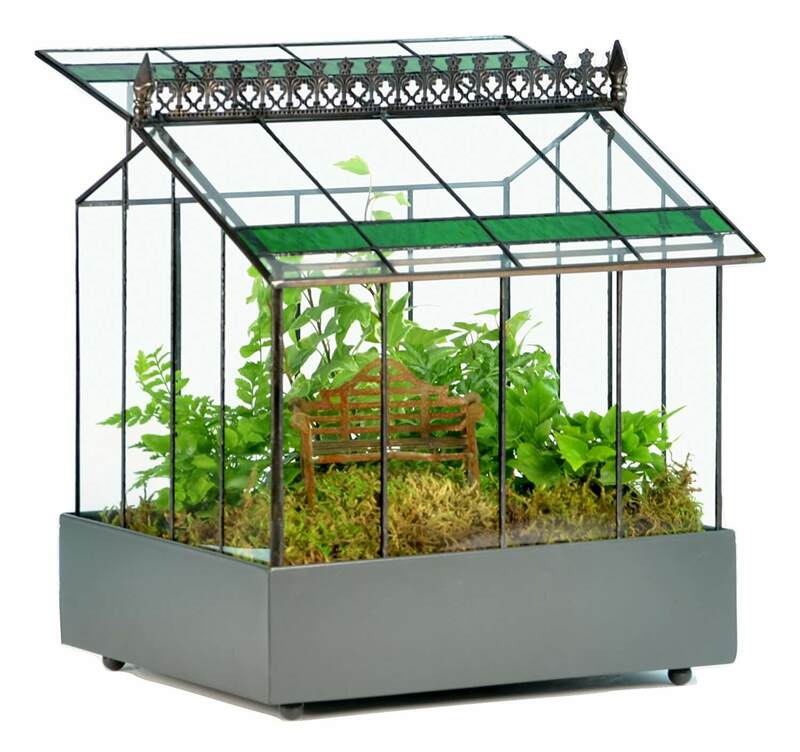 With a Wardian case, you could simply fill them with an array of interrelating miniature plants or ferns. But, Wardian cases also offer the opportunity to make a tiny garden scene complete with paths (just lay gravel on the soil), structures (purchase miniature buildings), mini birdbaths, elves, wheelbarrows, tools, birdhouses, you name it. Take your cue from your garden, your neighbor’s yard, or maybe a favorite picture of small garden design. Lay out some miniature carex plants, some selaginella, or several miniature Kenilworth ivy to form a “lawn.” Find or make a miniature trellis and use elfin herb (cuphea) or serissa to climb on it. Start by laying the “hardscape” and then plant in threesomes around the structures, just as you would work through your home landscape outdoors. Plant mini-trees or hang plants from twigs meant to mimic shrubs. Basically, you are shrinking the garden – so get whatever idyllic scene you want to ponder in your mind’s eye and go for it.